The energy drinks giant Red Bull has ended its trade dispute with a Norfolk micro brewery which has a similar name. Redwell, which was named after a street in Norwich, had been told it should change its name or face legal action. Red Bull now said there was "no dispute" and it was happy for Redwell to use its name as long as it did not use it for energy drinks. The brewery said the dispute arose after it tried to register its trademark in May. 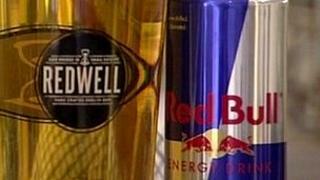 The Norwich firm said it had been threatened with legal action by the multi national, which claimed the name Redwell could "confuse" customers and "tarnish" Red Bull's trademark. A Red Bull spokesman said: "There is no dispute here. "Red Bull has long been willing to allow Redwell to maintain its mark for beer so long as they do not use it for energy drinks." "Red Bull know that Redwell won't venture into their markets and Redwell will be able to use their trademarks without fear of further legal action." Redwell said it had never had any intention to produce energy drinks at its brewery which employs eight people in Norwich.